Devon County Council is now the commissioner of most sexual health services in Devon, with the exception of HIV services, Sexual Assault Referral Centres and primary care contraception services which are the responsibility of NHS England and terminations of pregnancy which are commissioned by Clinical Commissioning Groups. The complexity of these commissioning arrangements is addressed through the Sexual Health Alliance which works to ensure sexual health outcomes improve, especially as they are an area where considerable health inequalities exist. Figure 8.10 below shows rates of acute sexually transmitted infections in Devon were lower than both the South West and England rates. There are large variations between the local authorities with Exeter having a statistically significantly higher rate of infections than nationally. Rates in all local authorities apart from North Devon and Exeter were significantly lower than the regional rate. The main genitourinary medicine clinics are in Exeter, North Devon and Torbay and access and accessibility may have an impact on those diagnosed. Services have been redesigned to enable integrated contraception and sexual health clinics to be offered in many of the towns across Devon at times convenient to the needs of both the young and young adult populations which will make accessibility easier. There are signs these clinics are being well used and so, although an increase in rates may be seen initially, this will have a positive impact on inequalities across Devon. HIV (Human Immunodeficiency Virus) remains one of the most serious communicable diseases in the United Kingdom, associated with morbidity, mortality and high numbers of years of life lost. There are high costs associated with both treatment and care. 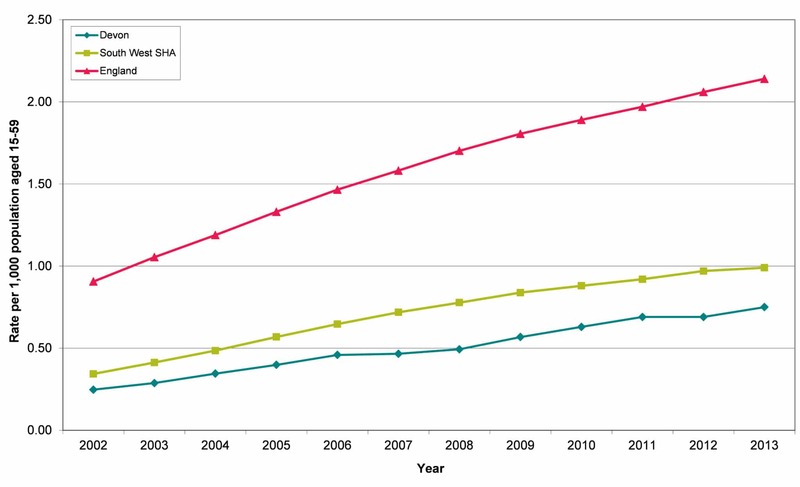 In the United Kingdom, health protection data showed an increase in HIV cases, peaking in 2005 and has since decreased. The numbers vary across the United Kingdom and Devon has a lower rate than the South West and England average. Figure 8.11 shows the prevalence of HIV in Devon, the South West and England. 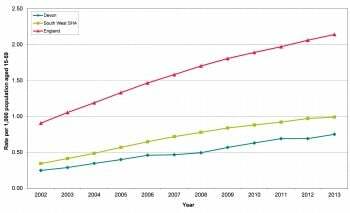 The Devon prevalence is considerably lower than nationally, although there is an evident upward trend, highlighting that life expectancy for people with HIV has increased substantially in recent years so more people are living with the condition. Prevalence varies across local authorities with South Hams having the lowest prevalence (0.53 per 1,000 aged 15 to 59) and Exeter having the highest (1.21 per 1,000 aged 15 to 59). There is a strong association between deprivation and teenage conceptions, with rates four times higher in the most deprived areas compared with the least deprived areas of England. A similar pattern is seen locally, with the highest rates seen in parts of Exeter, and other deprived wards across the county. Figure 8.12 shows teenage conception rates by District Council for Devon, highlighting that although the highest rates are seen in Exeter, the rates have shown considerable decrease. Year-on-year fluctuations are seen, which are mainly due to the low number of conceptions involved at a district level, but overall rates are showing a strong downward trend, a pattern that is also seen nationally.